a heart surrendered: Peace is what I crave! I purchased these lovely "fruits of the spirit" watercolor cards some time ago simply because of their beauty. I was not sure what I would do with them at first, and then an idea came to me. I purchased a small plate holder and place one of the cards on it each week so we can focus on that specific fruit. 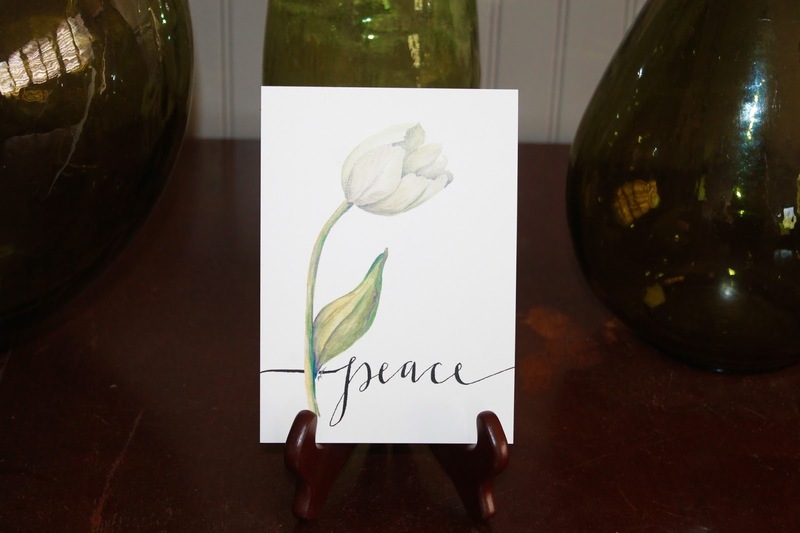 I have not been able to walk through our family room without my eyes being drawn to the card, thereby forcing me to meditate on the fruit displayed and praying for the Lord to make it a tangible reality in our home. This particular card will be staying in its place for another week. Or two. Or three. Because we haven't acquired it yet. I want peace to permeate our home. Not the peace that means 'quiet' but the peace that reflects contentment - stillness - gentleness - and joy. I want peace to permeate our relationships. Those that are effortless and those that are difficult. I want peace to permeate our hearts. A deep, satisfying inner joy that continually reminds us that "it is well with my soul." Oh, Lord, may this desire become a reality!